This photo is from about ten days ago, the one and pretty much only time we've had temperatures cold enough to form ice this winter. We're in a very warm and rainy period right now. 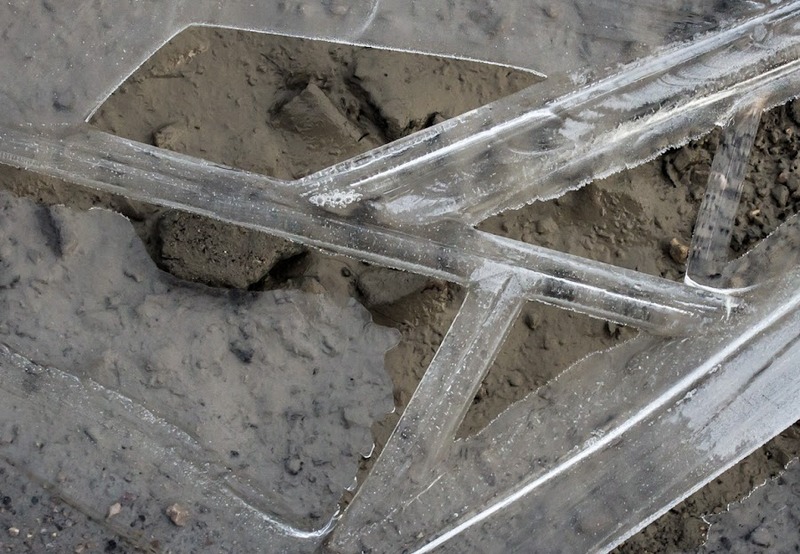 This puddle froze in a very strong geometric pattern. 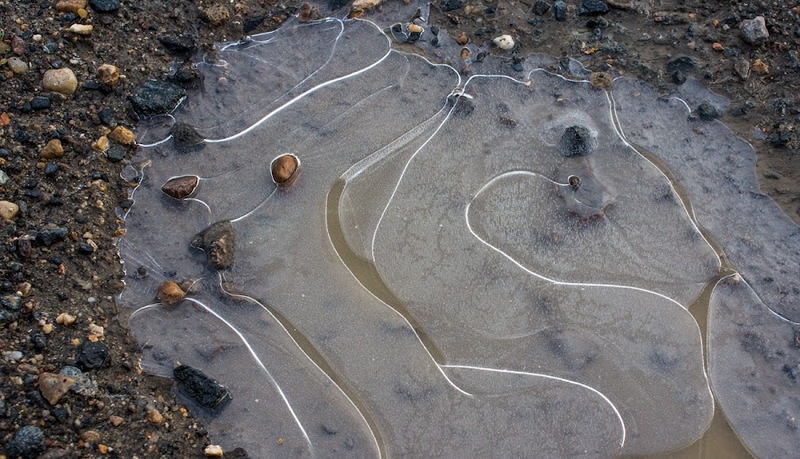 I don't know what causes some puddles to freeze like this while others have more curvilinear patterns. If you look very closely near the center of the image, you can see a group of tiny air bubbles frozen inside the ice. The women's final in Melbourne was a very fun match to watch, even though Serena Williams lost. Both women played great tennis, but I got the impression that Serena couldn't move as well as she has in the past. Oh well, it's hard to stay at the top of the tennis world at the ripe old age of 34; she's nearly a dinosaur in tennis years. Today's forecast is for wind and rain. I can already hear the wind outdoors early this morning. The rain is coming later. I'm planning to go out to the market for some of the ingredients to make crêpes on Tuesday, so I should probably get it together and go sooner rather than later. I want some mushrooms from the mushroom lady and some nice ham slices for the savory crêpes. We already have what we need for the sweet ones. A pile of dead and diseased vine trunks next to the vineyard parcel they were pulled from. The Australian Open finishes up this weekend with the women's final this morning (our time) and the men's final tomorrow morning (again, our time). It's nice to be able to watch the matches live, although I may record the women's match this morning so I can get to the market and back. I'm rooting for Serena! Tomorrow I'll root for the underdog, Mr. Murray, although it's probably Djokovic's match to lose. Most of the wine that Ken and I drink is very local to where we live. Some of it is grown right outside our back gate. A lot comes from within a few kilometers of our town, grown on the heights on either side of the Cher River. But we also drink wine from farther afield. I've gotten into the habit of buying Chablis at a local event where wine producers from other regions come to show and sell their products. We visited that particular winery in Chablis in 2014. Chablis is made from chardonnay and it makes a nice change from the local sauvignon blanc. Every now and then we enjoy wines from Burgundy, Bordeaux, the Rhône Valley, Languedoc, and, of course, Champagne. Most of those come from the supermarket. Welcome to Limeray, 50mm, f/8.0, 1/100s, ISO 320. Those other places are too far away to drive to on a regular basis; even Chablis is a three hour drive from here. Still, there are wine areas closer by, like Vouvray, Valençay, Chinon, Bourgueil, and Saumur, all part of the larger Loire Valley wine region, as we are, and each with its own special characteristics. On Wednesday, we drove up to Limeray which is in the Touraine Amboise AOC area. We stopped at one individual winery and a cooperative winery and came back with a trunk full of good stuff: over 50 liters of wine, including gamay, sweet and dry sauvignon, and some dry chenin. A nice haul! This is the last one, I promise. I'm not to the point of making plaster casts. Yet. The vineyard road continues to be a muddy mess. I'd rather it freeze solid, frankly. Callie wouldn't get so dirty on her walks. Oh well, this is the way it is. Muck. Yuck. 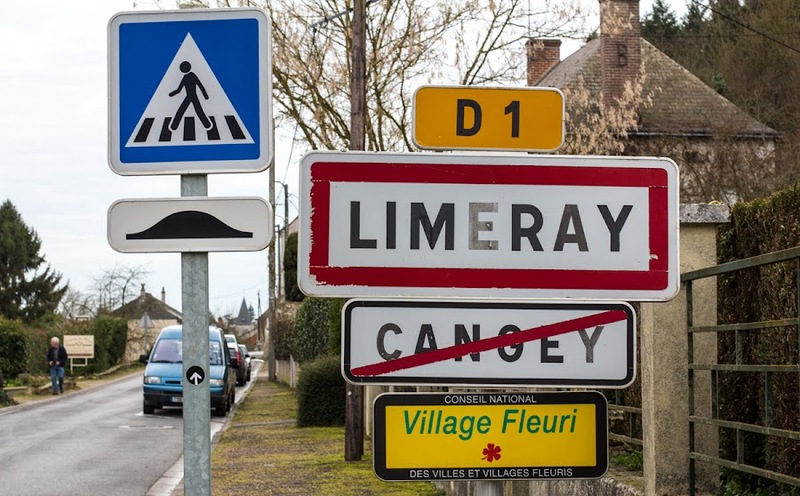 We made a wine run on Wednesday to a town up on the Loire called Limeray, about forty kilometers from us. There was a particular wine that I liked, a white made from chenin grapes, from a particular winery that we know up there. Turns out, they had run out of it until the 2015 vintage is bottled. It will be available in March. Not to worry, we didn't leave empty-handed. Or tyred, if you live in the UK. Now you can be tired, too. There are many species out there making tracks. Here's evidence of another. I don't know its nesting habits, but I'm pretty sure I know what it eats. Perhaps I should consult with Mr. Attenborough. I noticed that we're gaining three minutes of daylight today. The evenings are noticeably lighter now. That is, it's not quite dark at six pm. Of course, that depends on the cloud cover. In winters past I would often see the tracks of critters in the snow. Deer, hares, birds, foxes, dogs, cats, etc. 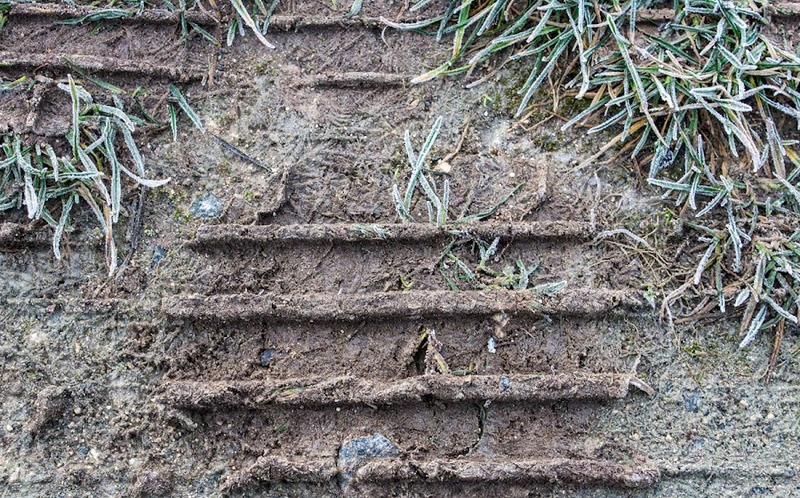 Now that we have mostly mud, aside from the occasional deer print, the tracks I see out in the vineyard are made by cars, tractors, and motorbikes. 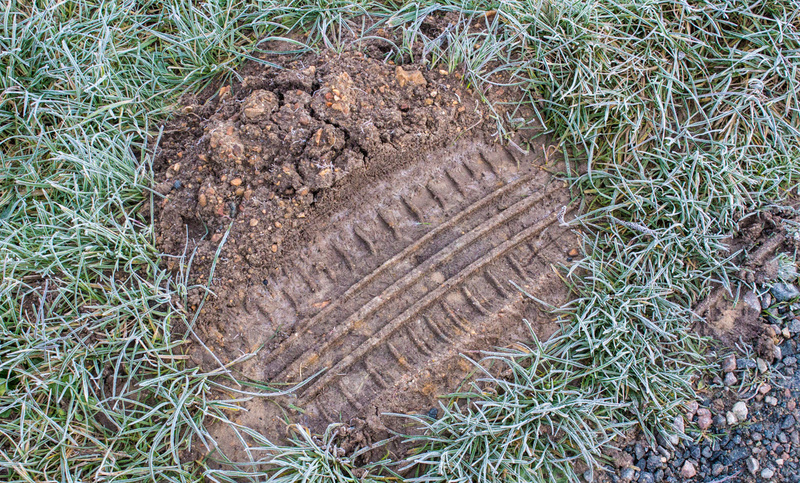 The vehicle that made this track rode over a mole hill on the side of the road. Ken made a pot of beans yesterday. They're little cocos blancs (tiny white beans) that we'll eat today with sausages. The leftovers will get made into baked beans, I hope. Next week we plan to eat a meal of crêpes stuffed with ham, cheese, and mushrooms. Crêpes are a traditional treat for la chandeleur (candlemas). More about that later. Monday macros has called in sick today. There's a nasty shutter bug going around. Ba-dum-pum. Filling in is a standard shot taken with the 15-85mm zoom lens. Last week, when it was cold, the puddles in the vineyard road had frozen over. Callie tried to break through some of them and taste the water below. I had to take the car out to run an errand on Sunday morning. When I started up the car, I noticed that Bert was sitting on the hood watching me. Rather than get out and move him, I started the wipers and sprayed the windshield with washer fluid. He jumped to the ground lickety-split. Plus, I got a clean windshield. This photo is from Friday morning, the last gasp of the winter weather that lasted almost a whole week. 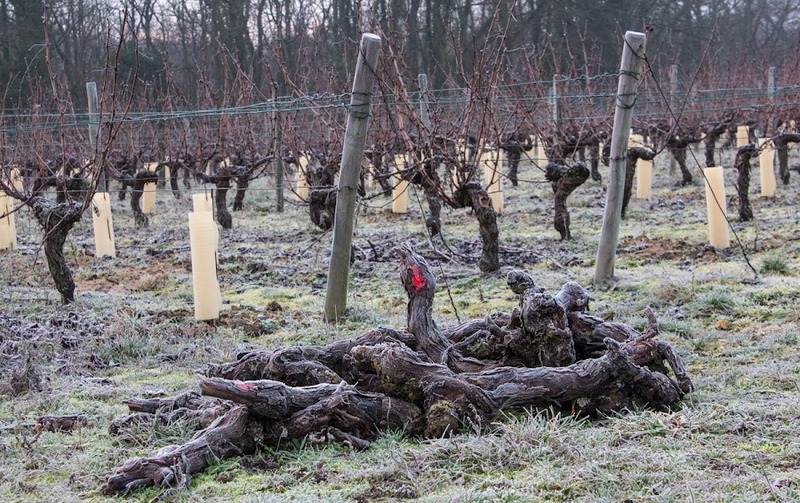 There was a little frost on the ground and on plants around the vineyards. 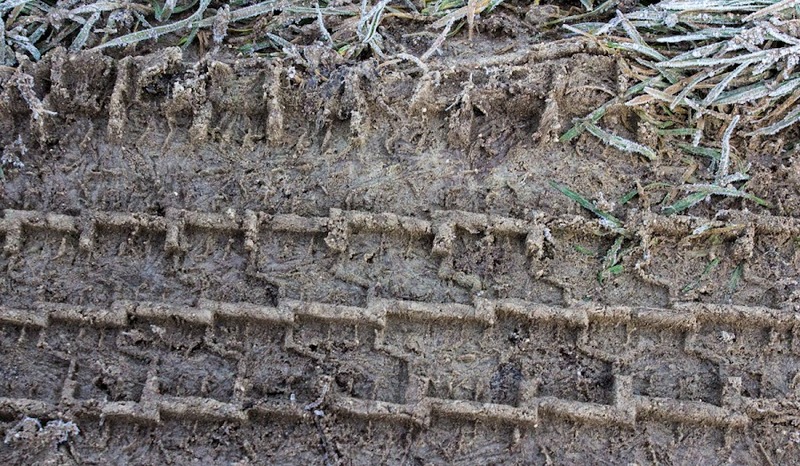 Now we're well above freezing again and are contending with mud. It's interesting to listen to and read about the snow in the eastern US. Neither Ken's (coastal NC) nor my (upstate NY) home town was affected by the storm this time. 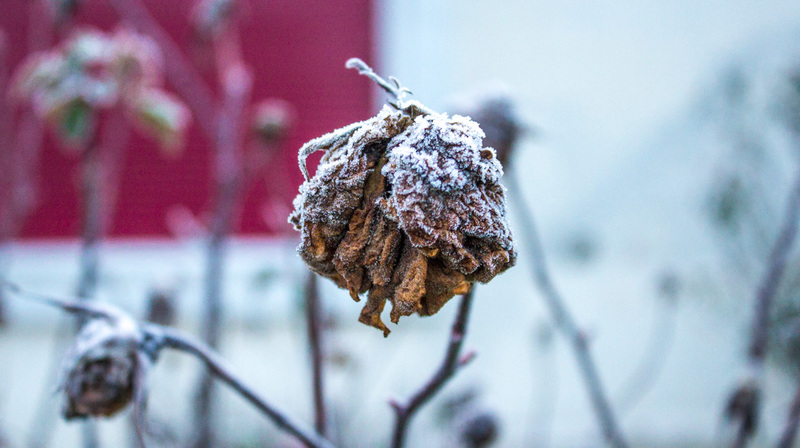 A withered rose in a neighbor's garden is touched by frost. It's quite possible that we won't see another snowflake for the duration of winter. It's also possible that we will. It's impossible to tell. But the trend has been to warmer, drier winters since we moved here. The whiteness of winter snow has given way to the gray of overcast days as we transition from some cold weather back to what seems to be our standard mild temperatures. As this is happening here, we're watching the snowstorm moving through the mid-Atlantic states in the US. Somebody on American television called it "snowzilla." I know that "snowpocalypse" and "snowmageddan" were already used in recent years, and "blizzard" may be just too boring. Journalism school must be so much fun. 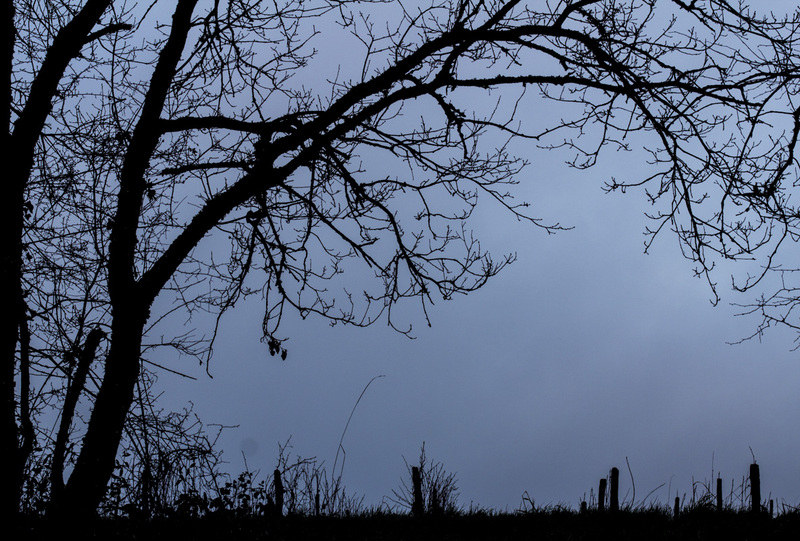 Friday morning was gray, dark, and a little frosty. This B&W image conveys the mood perfectly. We're planning to enjoy another slow-cooked meal today. Ken made a pot au feu (beef stew) in the slow cooker over night. It's a French standard made with carrots, onions, turnips, and potatoes. We've been invited to a neighbor's house for lunch on Sunday and we're looking forward to that. Sorry, more sticks. With droplets. 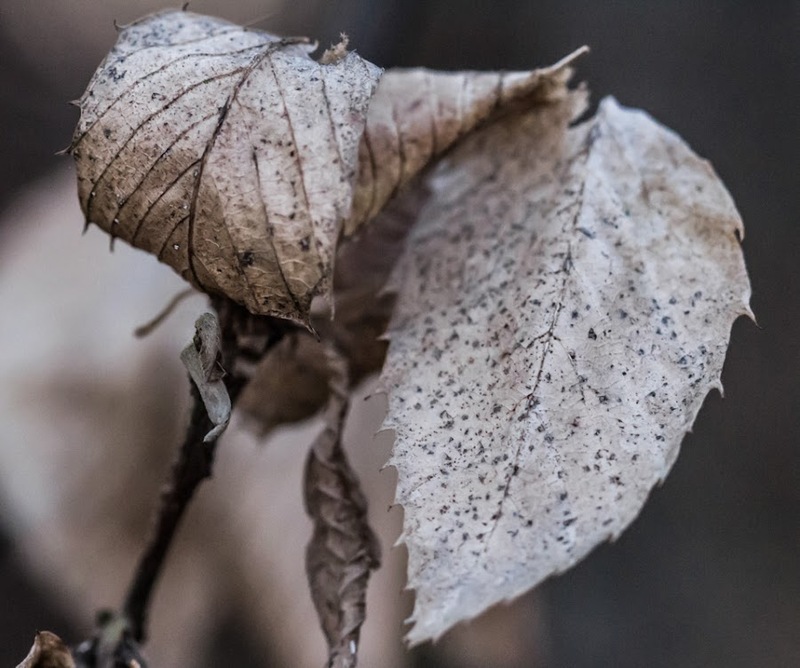 I always feel as though my photography is uninspired this time of year. Unless there's snow. Callie and I trudge through the muddy vineyard as the sun is rising or setting, often behind gray skies or in the rain. When it's wet, I don't take the camera at all. Oh well, lighter days are coming. 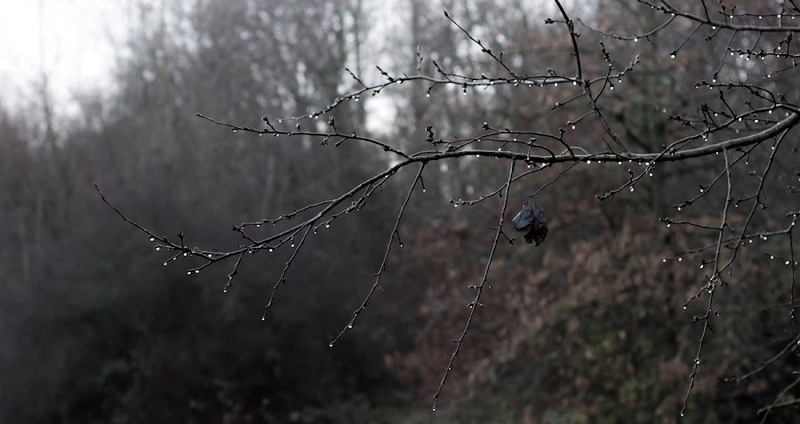 Drippy branch, 50mm, f/1.4, 1/100s, ISO 200. I tossed and turned most of the night, feeling like I didn't sleep. I know I slept some, because I had weird dreams. At one point I found myself listening to the washing machine go through its spin cycle, two floors below. Then I heard the heat kick on. Must have been the beans we ate for lunch. Today we're having veal. Until we have snow again, that is. I wanted to see how the camera would deal with the contrast between the brightness of the snow outside and the lower light conditions indoors. I took three pictures, two of them with the lights on. The one without the lights on didn't work very well. The view out onto the snowy deck. That's Callie's play sock on the floor. The snow is all gone now, except for a few spots where the plows piled it up. All that remains is soggy ground and mud. We're expecting a warm up on Friday as a new wet weather system moves in over us. That will be rain. When we woke up on Tuesday morning, we still had a lot of snow on the ground. Of course, that depends on the definition of "a lot," but I would say that most of the snow that had fallen on Monday was still out there. We had little to no wind, so snow was still covering most tree branches. Then, gradually, the day warmed up and it began to melt. Snow was still falling when I took this photo on Monday afternoon. More than an inch had accumulated on the deck railing. The trees dripped all day, and chunks of snow started falling from them. Big puddles formed on the deck so that I had to go out and push away the snow dams that were preventing the water from draining off. Little rivers formed out in the vineyard as the snow became water and started making its way downhill toward the river. 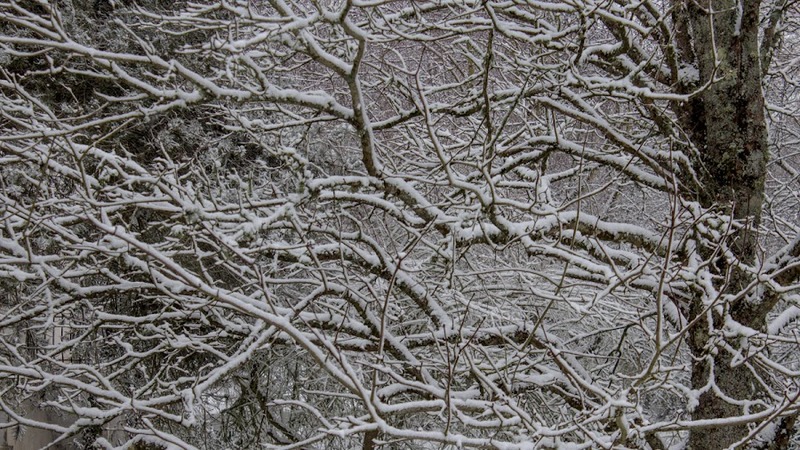 Tree branches covered in snow, before it began to melt. This morning the snow is mostly gone, although I can see traces of it in the coldest parts of the back yard, mostly in the shadow of the big hedge along the road. So much for the "blizzard" of January 2016. It officially feels like winter now. The snow started at sunrise on Monday and pretty much continued non-stop until nightfall. It didn't snow hard most of the time, we only got a couple of inches of accumulation. But a lot of it is still on the ground this morning, and we've been warned that the roads are likely to be slick in the early part of the day. We were planning to go out in the car today, but we've postponed that until Wednesday. By around 11:00 am the heavy, wet snow had started to accumulate on the deck. I was surprised at how much we got and that it's lasted this long. Micro-climates and all. River effect. Whatever. It's very pretty and it was kind of exciting to be out walking in it. I grew up in a snowy climate so none of this is new to me, just unusual for the places I've been living for the past twenty five years or so. Maybe I should go out and try to build un bonhomme de neige (a snowman). 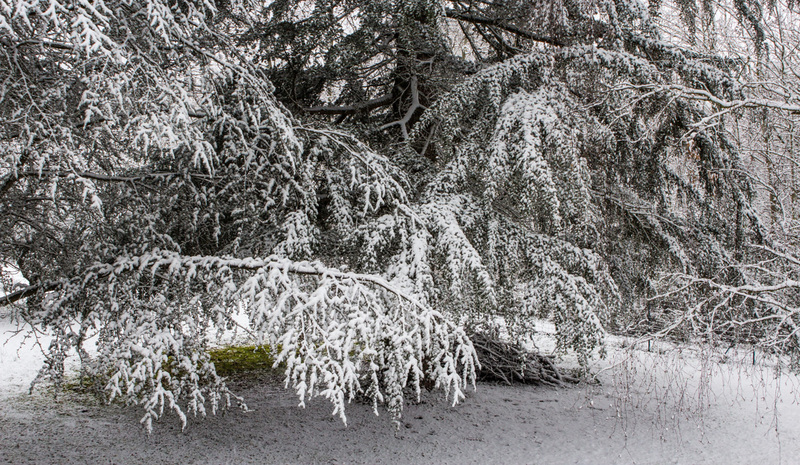 This was around 15h00 (3:00 pm) and the trees in our yard were heavy with snow. Ken and I both took photos during the course of the day (he even took some video that I think he's posting on his blog this morning). For those of you who live in snowy places, this ain't much. But for us, snow doesn't fall every year, and we haven't seen any accumulation in several years. So, yippee! 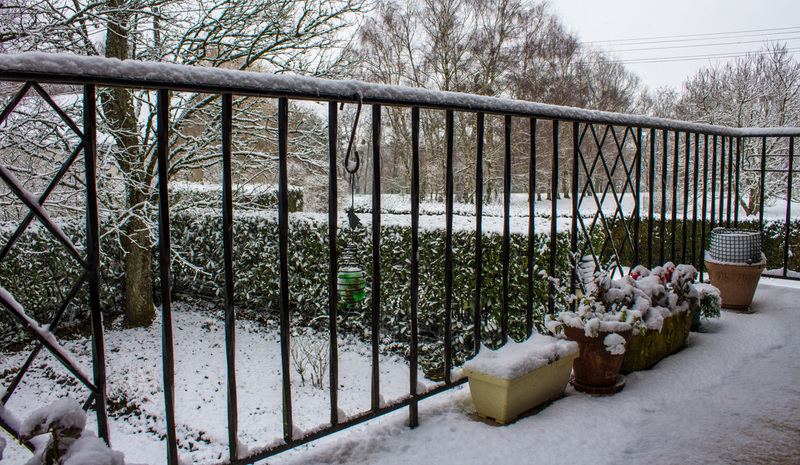 When it snowed on Friday, I noticed that the flakes were sticking to our deck railing for a short time before they melted. I got the camera out and tried to take some macro shots of individual flakes. I had to rush to find good examples before they melted, moving the camera around (on the tripod), refocusing, and messing with the settings. I was more or less successful. I think this one looks best in black and white, 100mm (macro), f/8.0, 0.4s, ISO 400. These are the best of the bunch of photos I took. I like that I can actually see the crystalline form of the flakes. If I had had a little more time before they melted, and hadn't been shivering, I might have got better shots. The flakes were gone within seconds of falling. I pumped up the blue tint a little for this one, 100mm (macro), f/8.0, 1/10s, ISO 400. It's chilly outside, so the days are all about cooking, eating, cleaning out the wood stove, chopping firewood, building and tending the fire, and watching stuff on television. Today I have Saturday's two NFL playoff games to watch (I recorded them over night). Tomorrow the Australian Open tennis tournament begins for two weeks of grand slam action! I wonder how hot it will be in Melbourne? A vineyard view from New Year's Eve. I made a batch of walnut and cranberry biscotti yesterday and they turned out well. Today we'll finish up the beef with carrots that Ken made a few days ago. We're expecting snow again on Monday. Probably just flurries. We had a couple of brief snow showers on Friday morning. A dusting stuck on the ground for a short time, but melted very quickly after. Driving didn't seem to be hazardous, although the bread lady, who arrived with her husband driving, said the roads were slick in some places. She didn't have any trouble getting up our hill. Ducks on a lake in mid-December. It feels more like winter now; we've gone below freezing for the first time, I think, this morning. 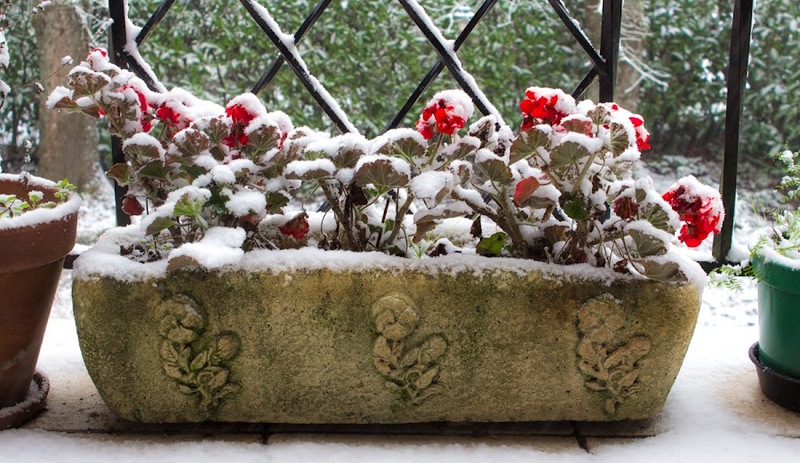 More snow is predicted for Monday, but probably not anything significant. The birds are enjoying the seed I put out for them. When it gets cold, the bugs and grubs and worms they eat get scarce. I've noticed more birds than usual at the feeders in the last day or so. The last march of the Ents. This makes me think of the tree-herder characters from The Lord of the Rings marching off to war. In miniature, as these are grape vine trunks and not tall trees. Maybe they're Entings? 50mm, f/8.0, 1/100s, ISO 640. It's just about freezing this morning and light snow showers are predicted this morning. I can see on the internet that it's snowing already in Le Mans, about 150km to our northwest, and it's moving this way. The ground is too warm for anything to stick, so if it does snow here, it will be pretty but inconsequential. I'm not holding my breath. **UPDATE 09h00: It's snowing! There isn't much happening. The weather has not been good for photos, and the days are still pretty dark. At least, they're dark when we're out with the dog. I'm sure you're tired of seeing pictures of sticks and leaves. Here's a restaurant that we went to in December. The food was pretty good and beautifully presented, but we were the only customers, which was a little weird. I think, based on its name, that it used to be a mill. 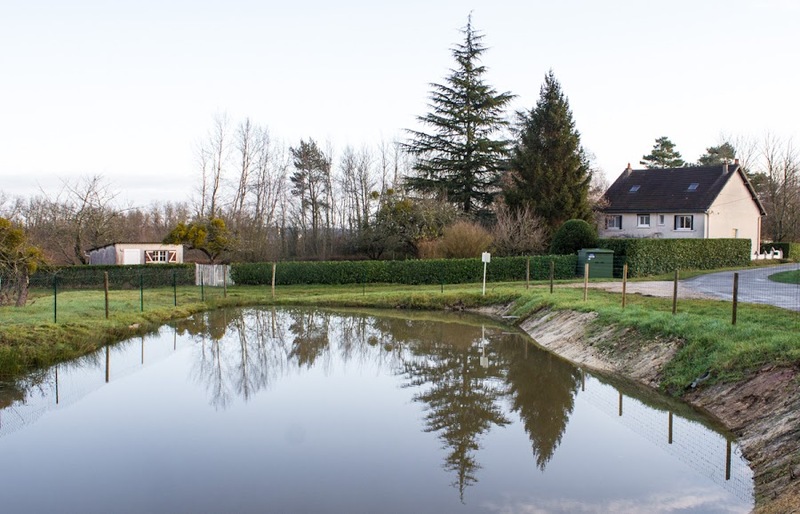 The building sits next to an artificial lake out in the middle of the countryside. It's a beautiful location. I'm sure there is plenty of business in the summer season (especially on the outdoor terrace overlooking the water), and maybe on weekend nights in winter, but we were there for lunch mid-week. 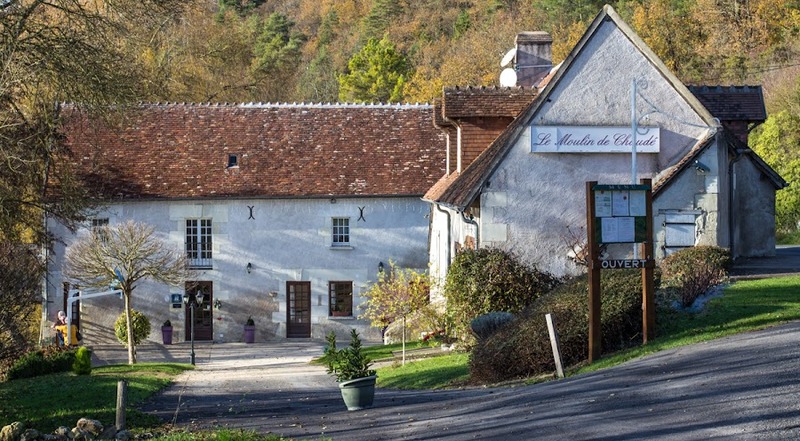 Restaurant le Moulin de Chaudé. As the days lengthen, I hope to get out and about a little more with the camera. 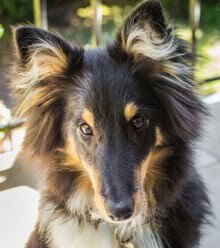 Sounds easy, but I'm a serious homebody and, from where we live, going anywhere other than for a walk involves the car. And Callie doesn't like the car, so that doesn't motivate me to go places with her. The temperatures are falling and we should be near or at freezing by Friday. I think it's going to be a kind of a shock to feel real cold after this unusually warm fall and winter season. Our new boiler will be put to the test. So far it's working fine and we're very happy with it. Our recent winds have probably blown these dried-up leaves off their tree by now. We've got some winter meals planned now. Today Ken is making (has made, in the slow cooker) a bœuf aux carottes (beef stew with white wine and carrots) and we're planning a blanquette de veau (veal stew in a cream sauce) for later in the week. We got the beef and the veal on sale last month and they've been hanging out in the freezer. Those two dishes should feed us for a while. And I have pizza planned for over the weekend. Today I'm making a wine run; I've run out of rosé (gasp!) and we'll need some more red before long. There's a winery whose rosé I like a couple of towns over, so I'll head over there later this morning. 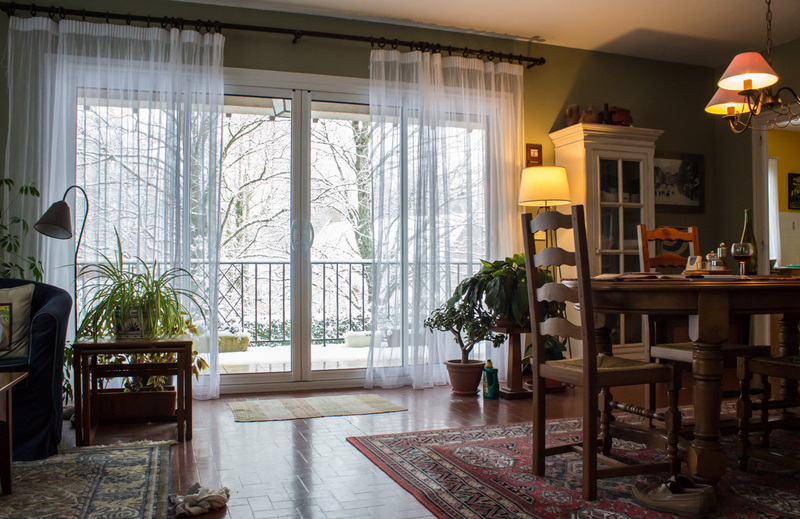 I find that I usually see the rooms in our house from the same vantage points: my chair at the table, where I sit to watch television, where I stand to see out the windows. Every once in a while, if I sit somewhere else, the room or rooms look different from what I'm used to. 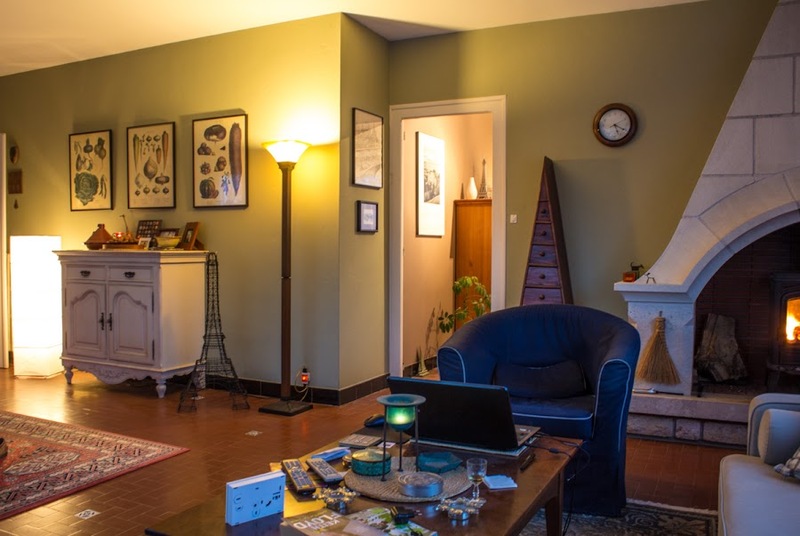 This view of the living/dining room, for example, is not what I usually see. The television is behind me and I'm looking back into the house rather than out through the doors to the deck. It struck me as funny looking (funny strange, not funny ha-ha), so I took a picture. I turned the lights on for the photo because the sun had set. Don't mind the mess on the coffee table. The weather people are telling us that winter is coming. Finally. Single-digit temperatures are predicted for the coming week (in Celsius, all above freezing), then some freezing weather after that. We'll see if the forecast holds. 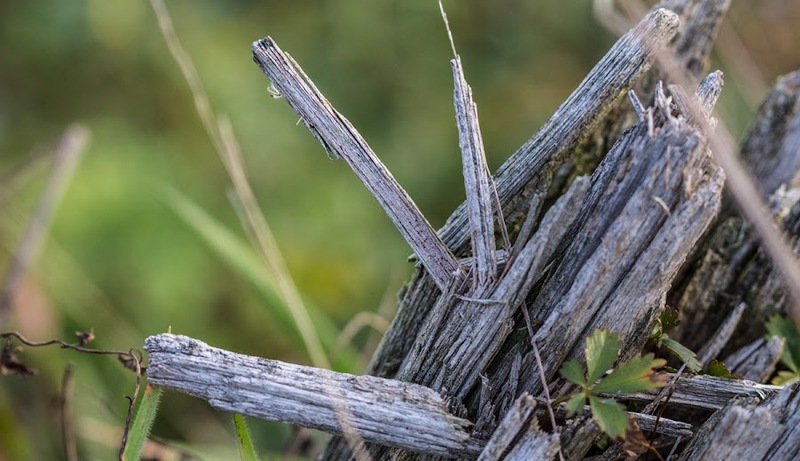 The shards of this broken vineyard post made me think of crystals. My mind works in mysterious ways. When it works. Splintered wood, 100mm (macro), f/3.5, 1/250s, ISO 800. The rain squalls and wind gusts continue and are expected to do so for another twenty-four hours or so. The wind is still not as strong as they've been predicting, and that's a good thing. But it's quite wet outside. I've had to face facts: I can't do the hedge trimming any more. Certainly not the high hedges, and until my elbow heals, not even the low hedges. So I asked the landscape contractor to do them all this year. I also asked him to reduce the height of another section of the hedge out back. It's the western edge that looks over the vineyard and now it's all the same height. I'm pretty pleased with the result. Another advantage of having the contractors do all the work is that they also do all of the cleanup and take away the trimmings. Here are some photos. I didn't get any true "before" shots, but i did get some "during" and "after." The section on the left is done, the section on the right will be reduced to the same height. 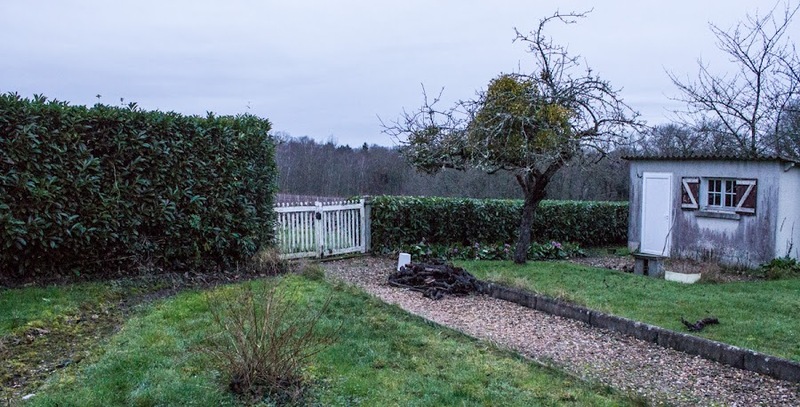 The finished hedges, reduced in height and trimmed all around, seen from out back beyond the pond. View from inside the back gate before the height reduction. View from inside the back gate (different angle) after the height reduction. This isn't a very satisfactory shot. The cake got mushed down when cut, so you don't see all the layers of pastry. But trust me, they're there. When we had our first slices, neither one of us found the prize inside. Same thing on the second day: no prize. Finally, yesterday, we had the last two slices and I got the prize, a little ceramic salt pot (I saved the fèves, or prizes, from galettes we bought commercially years ago and now use them in my own cakes). 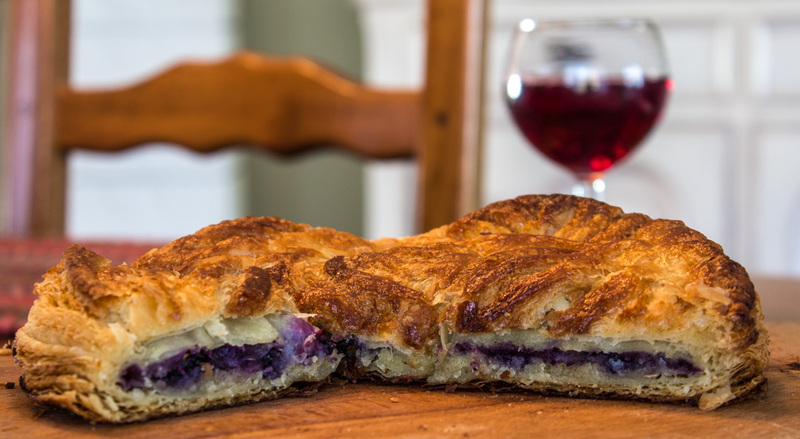 You can see where the layer of blueberries colored the almond cream inside the galette. We are getting warnings from the weather people that a storm will be moving through on Sunday night with high winds. Yuck. I hate wind. I'll have to batten down the hatches and check the yard for anything that might blow around and put it indoors. I'll also gather up a couple of days' worth of dry kindling and put it in the garage. Here is a winter scene from this past week. Doesn't look very wintry, does it? But it's what winter looks like around here most of the time. We've had snow in years past, but it never really amounts to much and it doesn't last long. In one exceptional year we got close to a foot of snow and it stayed on the the ground for more than a week. Otherwise, when we get snow, it's between a dusting and maybe an inch or two, and it melts away quickly. 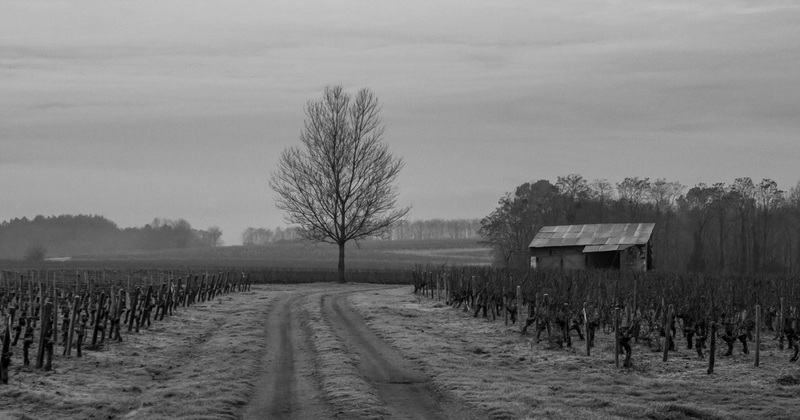 Vineyards in winter, 50mm, f/8.0, 1/125s, ISO 500. For today's lunch Ken's making chicken Kiev. I don't think I've ever had it and I know Ken hasn't eaten it in decades. We saw Jamie Oliver make it on television and thought it looked good. It's one of those dishes that was in fashion back in the seventies but has pretty much gone away. If it works out, there might be photos. Even if it doesn't work out, there might be photos. A reminder: Friday fifties refers to photos taken with my 50mm prime (fixed) lens. It's an exercise to get myself to use it more and to rely less on the zoom lens. Well, maybe not. But it is a king cake. The word "cake" is not accurate. It's really a pastry called une galette in French. The dictionary describes a galette as a flat, round, flour/starch based cake or crepe. The word comes from galet, meaning a rounded stone polished smooth by waves or running water. The finished galette. It rose nicely. I made the puff pastry on Tuesday by wrapping a flattened block of butter inside a simple dough made with flour, water, and salt. The dough block then got folded over itself six or eight times, with half-hour rests in between each fold. The folding creates thin layers of flour and butter that, when baked, rise into a flaky pastry. I rolled the finished dough and cut two disks. I spread an almond frangipane (a mixture of ground almonds, butter, and an egg) in the middle of one disk, topped that with some blueberries, added the little ceramic fève (prize) and covered it all with the second disk, sealing the edges with an egg wash. Finally, I made designs on the top with a knife and brushed on the remaining egg wash before baking it in a hot oven. We each had a slice yesterday evening, but neither of us found the prize in our piece. Maybe today when we have more. I'll try to take a photo of the sliced cake later so you can see what it looks like inside. Naturally occurring color is all around in us in the middle of winter. 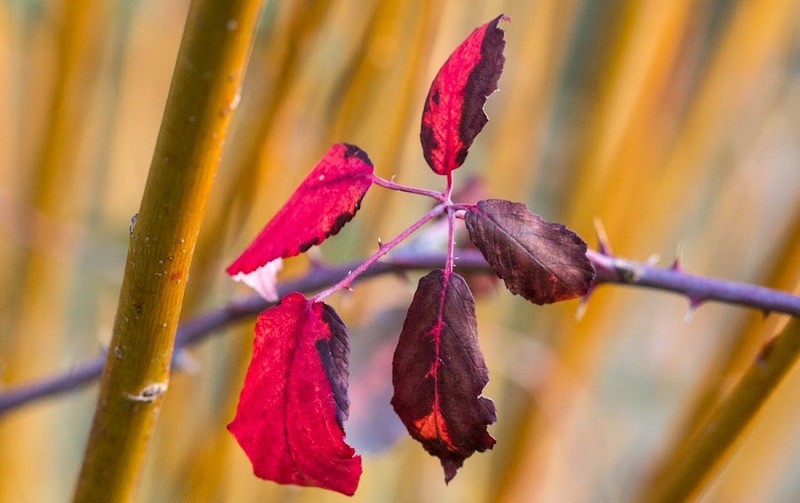 Even when everything seems brown and dormant, there is still a lot of vibrancy out there. The yellow in this photo comes from the stems of osier (wicker) which grows wild on the edges of the vineyard near where little streams run. The red looks like a wild blackberry plant that's held on to some of its leaves. Lots of autumn leaves remain on the trees and plants partly because we've had no freeze yet this season. Today is the epiphany on the Catholic calendar and, in France, the tradition is to eat une galette des rois (cake of the three kings). 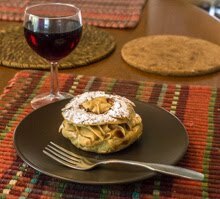 The cake is made with puff pastry, stuffed with almond frangipane, and a little fève (bean). When the cake is sliced, the person whose slice contains the fève is crowned king for the day. Store-bought cakes come with a golden cardboard crown for the occasion. I made my own puff-pastry and will assemble and bake our cake today. Water droplets adorn this winter branch like so many pearls. Or maybe like holiday lights on a tree. When I took this photo and saw it on the camera's little screen, I thought, oh well, not very interesting. I felt the same way when I saw it on the larger computer screen. But I messed around with it a little in Lightroom, cropping out the edges to start, then adjusting light and color. I still don't think it's as good a shot as it might be, but I like the effect. Or at least the idea of it. The only "swine" in these parts is the occasional wild boar. I think that the high pressure systems that kept us warm and dry through much of the fall have broken down. We're getting waves of unsettled weather (meaning rain squalls) and the temperatures, while still above normal, are less unusual. But we have yet to have a freeze. Callie and I ended up in the piney woods the other day during our morning walk. As the needles fall from the trees, a lot of them get caught on branches before hitting the ground. They look as if they're sitting there deliberately, straddling the branches, enjoying the view. 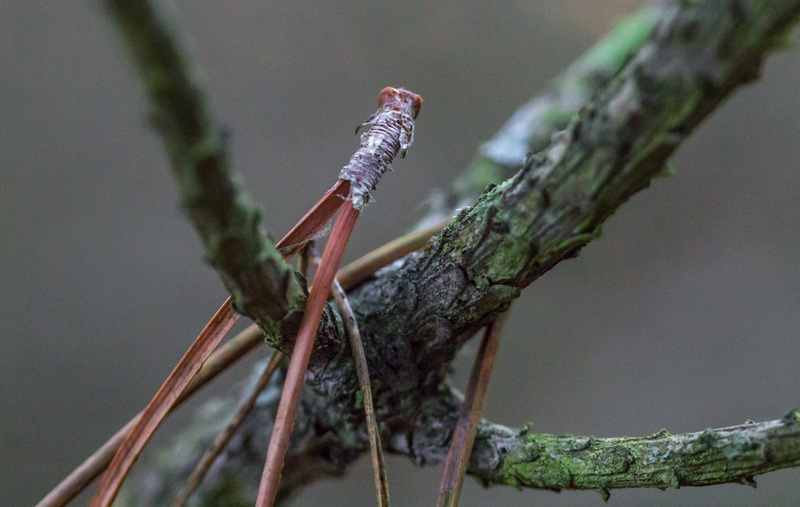 Just hanging around, 100mm (macro), f/2.8, 1/200s, ISO 6400. We watched the finale of "Downton Abbey" last night. I understand that the final season just started in the US, so I won't tell what happened. Except to say this: the end was a bit sappy. It's hard to believe the series started six years ago. In France, it started in December 2011. We were a year behind. But the series became very popular and they got us caught up so that we saw the last couple of seasons pretty much at the same time that they aired in the UK, and before they aired in the US. And now we're done. By the way, we have the option to watch many foreign programs (especially movies) in their original language, with French subtitles. For us, there's really no point in watching an English-language film or television program dubbed into French. Likewise, we watch French films and television in French. The original language and, by extension, the original actors' voices are always better. We're expecting rain and wind to move in this morning. It's supposed to be wet most of the day. Saturday was sunny and nice all day, so we can't complain. And, while the temperatures are dropping a little, we're still above normal for this time of year. That means no snow for us. The smallest, wispiest canes will be removed this winter. This is one of a few grape vines that have been trained against the wall of the old storage building out in the vineyard. They do produce grapes (I'm not sure what variety), but they're only harvested (as a snack) by people walking past and by the wildlife. 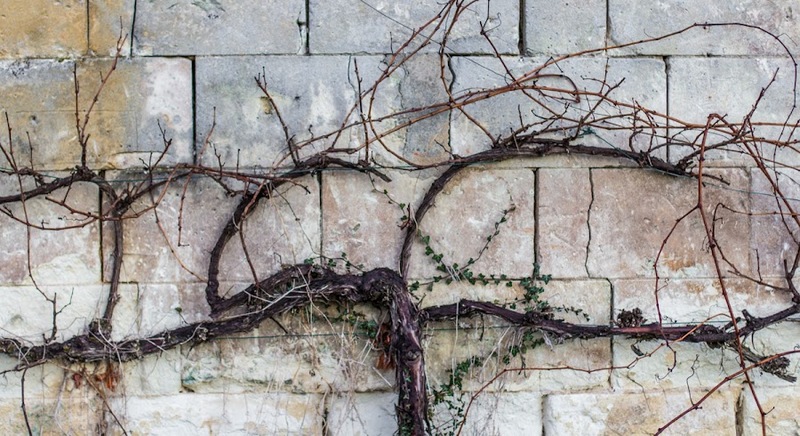 Still, the vineyard workers prune it every year along with the other vines. Today I'll put Christmas away. The tree will be undecorated and all the baubles and lights will be packed away for another year. I used to do this on New Year's Day each year because I usually had to go back to work the following day (except in years like this one, where the following day is a weekend day). I've never been one for leaving the tree up into the new year. A communications tower disappears in the morning fog out beyond the vineyards. But the holidays are not over. 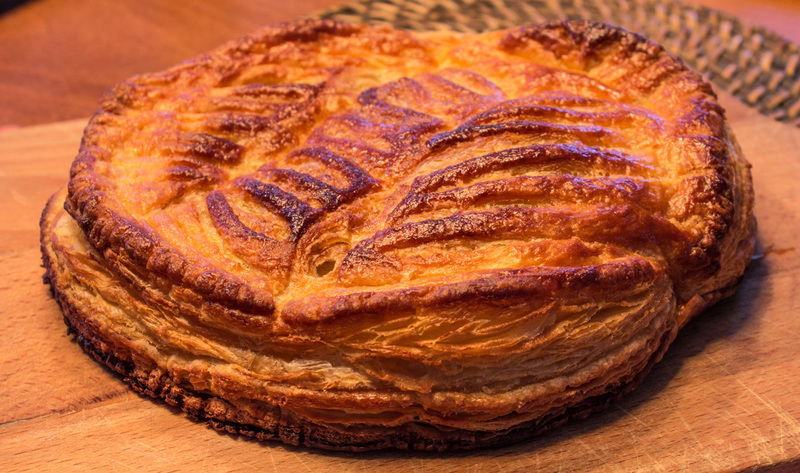 We have the Epiphany coming up next week and I will make puff pastry for the traditional galette des rois (Three Kings cake). Then in February it will be time for crêpes, the traditional food for la chandeleur (Candlemas). By then, spring will be in sight. The dawn of a new year, 50mm, f/8.0, 1/125, ISO 125.